During the past years, DSI has followed by several comprehensive research in order to make and deliver the best technology in dental implants field. 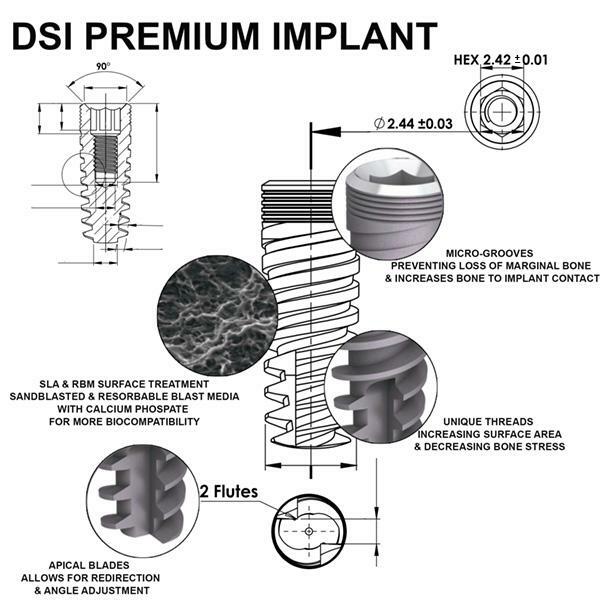 Now DSI developed DSI Premium - a latest generation high level improved implants, which combine all the recent researches and developments in the industry. DSI Premium line of implants is designed to improve and speed up the healing process and the growth of the tissues adjacent to the implant surface. DSI Premium implant manufacturing starts with a use of highest quality raw Titanium ELI Grade 5 (Ti-6AI-4V) material. 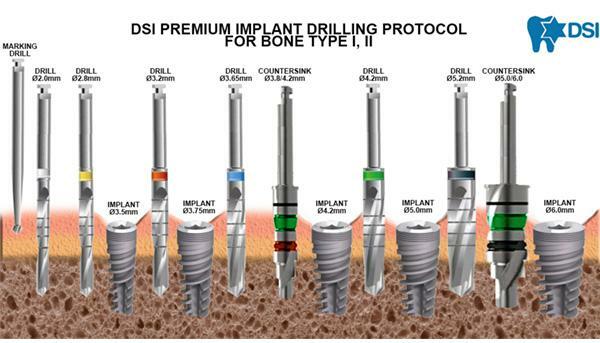 DSI uses only the purest and finest Titanium raw material, in order to make the implant to withstand any challenge: during the placement and for a long-term use as well. DSI Premium line has a spiral root-shaped geometry and a unique thread design that ensure superior primary stability, offering the ultimate choice for a wide range of clinical cases and loading protocols. DSI Premium implants exhibit strength, stability, and ease of surgical insertion, these implants made especially for an immediate loading. Nowadays, more and more patients demand the immediate loading of the implant in order to achieve a faster result, while not being held by the surgical procedures for a long period of time. DSI Premium line of implants makes this happen, by saving your chair-time. Our implants have a secure and years-proven internal hexagon connection, assuring proper implant abutment seating, anti-rotational engagement, resistance to lateral forces, excellent esthetic results, and compatible with a great variety of dental implant systems on the market. Micro-rings on the implant neck improve BIC (Bone To Implant Contact) at the crestal zone, and reduce the pressure on the cortical bone to minimize resorption at the implant neck area. The implant has the apical blades that allow for redirection & angle adjustment for parallelism during the insertion process. The square threads at the bottom decreasing bone stress level and transfer the extended load to the sharper threads for self-tapping function. mechanical strength as well as osseointegration properties. The SLA implants are dry-stored after sandblasting and acid etching showed that surface. RBM plays the role in Roughened implant surfaces and provides increased retention strength. The topography, down to the micrometer, affects the attachment and growth of bone cells. DSI applies the RBM (Resorbable Blast Media) technique in order to induce the sub-micro topography. The material used for the RBM process is Calcium Phosphate, which is a highly resorbable and biocompatible material. Usage of Calcium Phosphate as the blasting material also eliminates the need of using strong acids for the removal of blasting material remnants. Such surface technology gives a huge advantage for immediate loading, and excellent biocompatibility, to reach the optimal osseointegration and complete healing process with no abruption. Promotes earlier bone apposition and provides greater implant stability during the first critical weeks after placement. 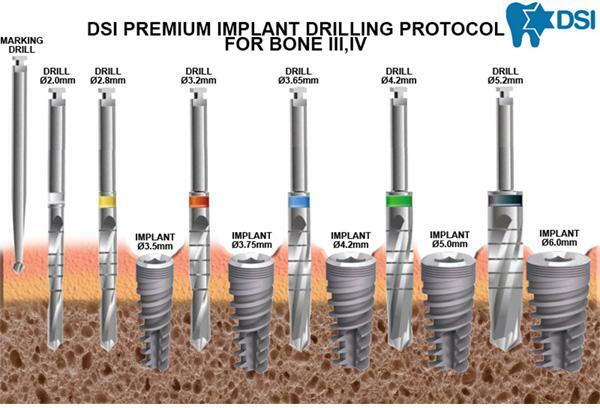 In conclusion, DSI Premium implants are created with premium titanium body that provides great biocompatibility, corrosion resistance, and it is proven to be the most demanded commercial metal alloy in surgical dentistry. The shape of the implant is made for a simple and easy work, for an immediate loading, and increasing the osseointegration level. The SLA/RBM surface coating is made for enhancing the healing process and tissue growth around the implant. with no worries of abruption or disintegration. Universal Internal-hex connection fits wide range of restoration parts. The info presented in current drilling protocol is based on vast experience collected by specialists using our implants all over the world. We recommend using a drill with a diameter slightly smaller than the implant, in the case of a soft bone condition.